Outstandingly luxurious with a premium 1200 thread count, this incredible comforter from Elle feels smooth and sleek against your skin. This excellent piece is made from polyester that's naturally hypoallergenic, and lends a subtle elasticity that allows you to wrap yourself up on cold nights. Best down comforter I've ever owned! I got this comforter after we had a house fire and had to replace everything. I was so sad to give up our old one, we'd had it for years and I always dread buying new down blankets because you just don't know what you're going to get when you order online. This is seriously the BEST comforter we've ever had. We even used it for a few months before I put a duvet cover on it. I just had to buy another one because my husband and I fight over it all the time! :) It fluffed up beautifully after a few hours and never had that terrible feather smell to it. I even wash it in our washing machine instead of having it dry cleaned. It washed wonderfully! I was afraid to put it in the dryer, but it came out even better than it was before washing. You can't go wrong with buying this blanket, I don't know why the other reviews say it isn't fluffy... It's VERY fluffy! At first I was somewhat disappointed that this comforter wasn't nearly as fluffy as my previous comforter, which I definitely wanted. But after having this comforter for a little while, it's a very comfortable weight and is quite versatile to temperature due to this feature; making it comfortable on nights ranging from quite warm to very cold. I have 2 down comforters, same filling as this one - 600 and they all look the same. Don't expect it to be filled a lot, but it's very warm during winter. it is way to warm for summers. The only thing about this item is that 1200 thread count is a mix of cotton and polyester. It came clean and has great natural smell. Luxurious! Fresh smelling! Unbelievable quality for the price! I'm absolutely IN LOVE with this comforter. So much so I had one and bought another! It's plush and soft to the touch which makes you look forward to crawling under it every time you get in bed. The thread count and feathers are top notch. I do feel like it should be bigger, but the luxuriousness has allowed me to over look aspect. Some baffles were severely under filled. When I held this comforter up in the light while fluffing it up after unpacking it, I noticed a several of the baffles in the comforter were severely under filled. The light shined right through several of baffles and I could see that there was next to no filling in them. And this was after properly fluffing the comforter after unpacking it. This was more than a little disappointing considering how much this comforter cost. The comforter still feels warm, but it is also summer in Texas so I haven't had a chance to use it in very cold weather yet and i'm afraid that those nearly empty baffles will result in some very large cold spots. We had been looking for a reasonable priced quality down filled comforter. Found this on Overstock for less then the price of a new 400 count one at a well known outlet. The quality is great. Very warm and very light. I like the comforter and it's warm and light though I was hoping it would be a little more fluffy. Overall, a well made down comforter. Such high quality! Heavy fill feels unbelievable!!! Love this purchase! Would highly recommend it's really warm though, the first night I had to take it off. Great price, amazing product would buy again. This was okay. I felt like it was more of an alternative down comforter. It wasn't as lightweight as I thought that it would be. The material was mediocre as well. Maybe I had expectations of an expensive down comforter but I felt like this was a little misleading. Really nice down comforter, recommend it highly. Very warm and fluffy. I bought a King size for myself and a a full size for my son. Great year round comforter, light weight and not too hot in the summer. Square compartments keep the stuffing evenly distributed, making for all-around ease of use. The first few months using this comforter was nice. Then we started noticing that the down was falling towards the bottom and leaving the top empty. Now, 6 months later, the top baffles are nearly empty and the weight of the bottom baffles pulls the comforter off the bed. You can see through the empty baffles in the picture attached. I bought this to replace the down comforter I bought 8 years ago for $** (on Overstock). Still had more fill in the middle than this one, even after fluffing and airing out. Very disappointed. "Is the product duck or goose down? " Whenever you see the word white down it means white duck down. If it’s white goose than we will call it white goose down. "Other than around the four edges, are there seams across the face of the comforter?" 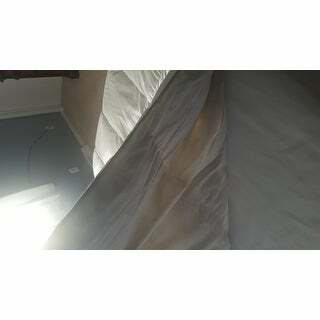 Hello sdeuser, there are large square seams along the comforter. Thanks for shopping with us!